This rare example is a 1903 Harley-Davidson single--essentially a bicycle with an engine. It's what started the company on its 100-year journey through wars, depressions, changes of ownership and the ups and downs of motorcycle racing. 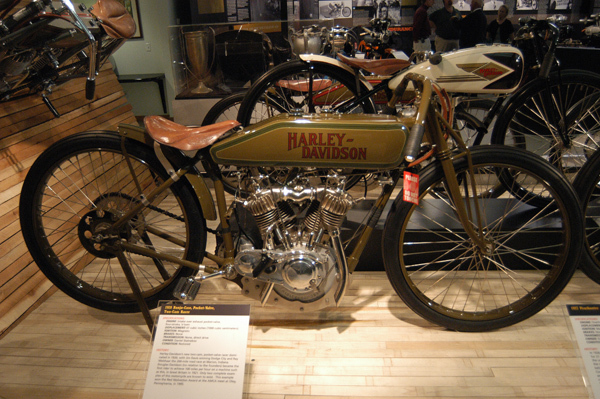 By 1920, Harley was making singles and V-Twins, and this 1920 race bike used two separate camshafts to operate the engine's overhead intake valves. An earlier model in 1913 sported a double-overhead-cam 4-valve engine. 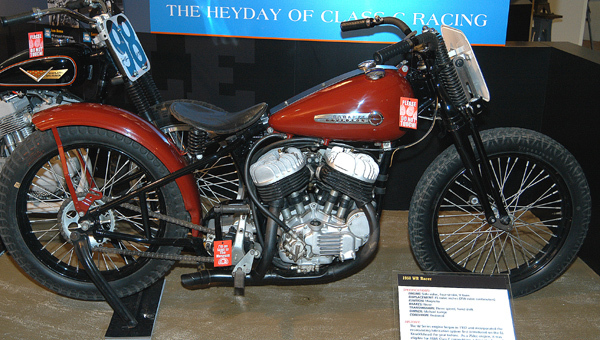 1955 KHK. 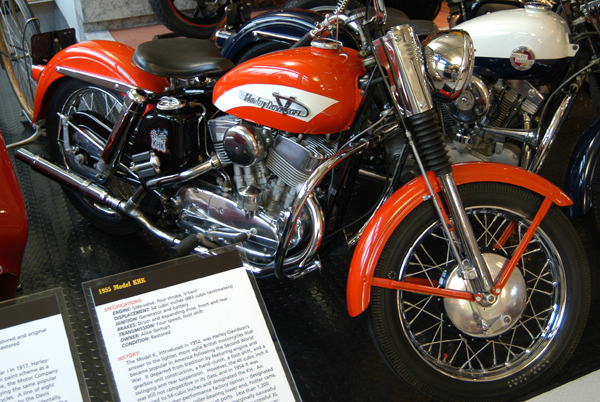 Harley's first true high-performance street bike was the 1955 KHK, like the one shown here. It featured a larger flathead engine, 54 vs. 45 cu.-in. of displacement, rear suspension, a higher compression ratio and hotter camshafts in order to compete with the BSAs and Triumphs of the day. Two years later, it morphed into the XLCH Sportster 883, that's still sold today as Harley's entry-level model. 1970 SUPER GLIDE. 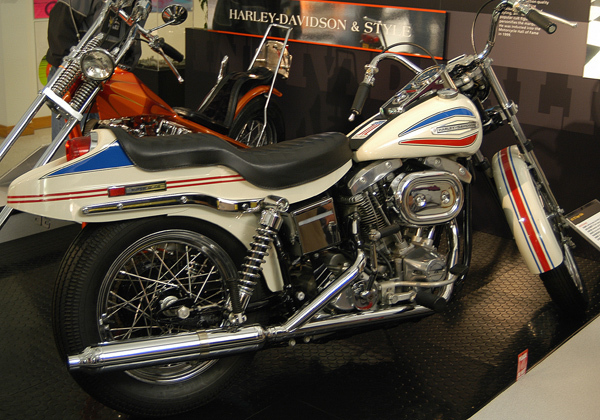 Willie G. Davidson has been in charge of Harley's design department for more than 30 years, and this was his debut piece--the 1970 Super Glide with its raked front end, fiberglass tailpiece and red, white and blue paint job. XLCR. 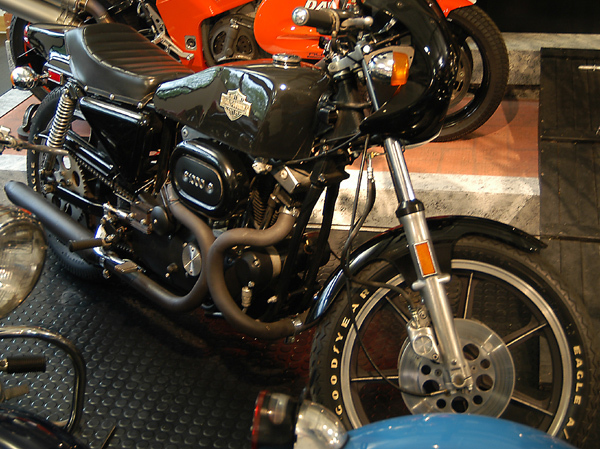 Cafe racers were popularized by the Brits and the Japanese in the 1970s, and the XLCR Cafe Racer limited-production model was Harley's offering. It had siamesed exhaust pipes and a coffin-shape tank, and nearly every piece of it was black, black, black. BUELL RS 1200. 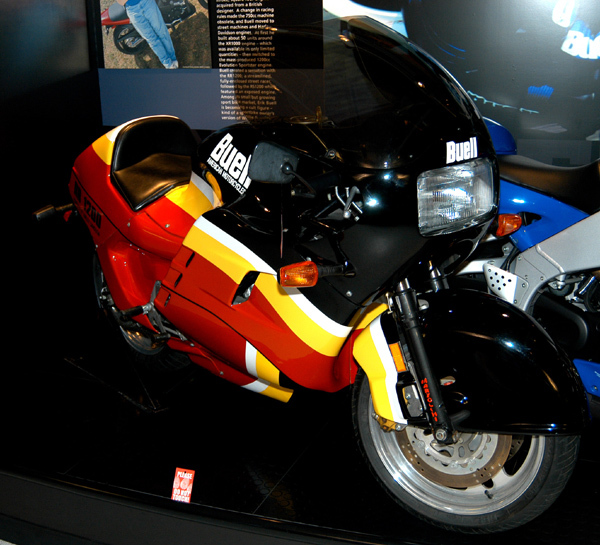 Erik Buell was a Harley-Davidson engineer who struck out on his own after-hours and produced Harley-powered specials such as this Buell RS 1200 touring machine. His stuff was so good, his ideas so innovative, Harley bought him out and Buell is now the entry-level and high-performance sportbike division of Harley-Davidson. 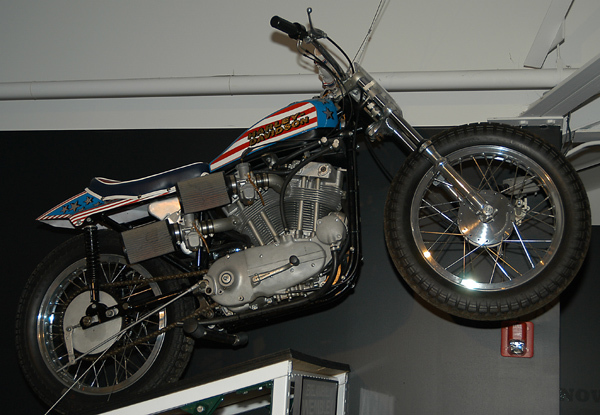 EVEL KNIEVEL XR750. And then there was Robert "Evel" Knievel, the man who pioneered motorcycling's major-event business and singlehandedly started what became the X Games. This is his XR750 stunt cycle. COURIER BIKES. 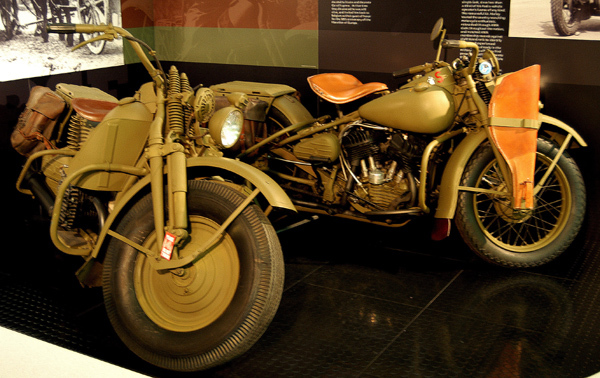 World War II saw Harley-Davidson convert for war production, as demonstrated by these two courier bikes. The one on the left is powered by a BMW R32 horizontally opposed flathead Twin engine, the one on the right is all Harley. Founder's son John E. Harley was the director of motorcycle rider training at Fort Knox during the war. WR 750 FLATHEAD. After World War II, the AMA racing rules were changed to bring costs down for all the factory entries. The new law dictated that all race bikes must be based directly on high-volume production machines. This Harley WR 750cc flathead race bike was one result. Note that it has no brakes and no rear suspension. 1965 ELECTRA GLIDE. 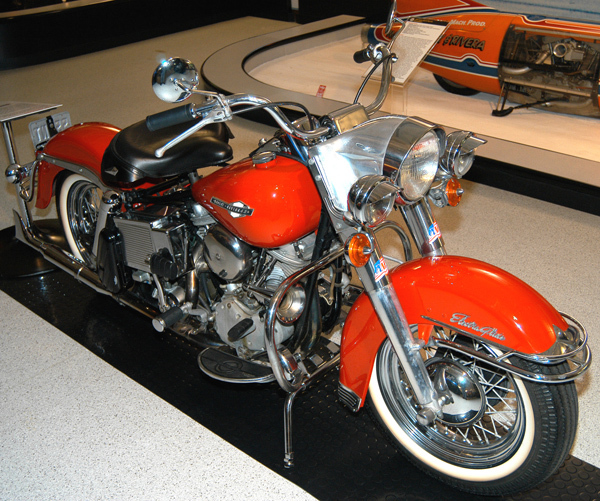 The Heroes of Harley-Davidson exhibit has only one bike you're allowed and encouraged to sit on, this 1965 Electra Glide, with electric starting and overhead valves. It started a revolution in Harley's big-bike designs. 1974 AERMACCHI. 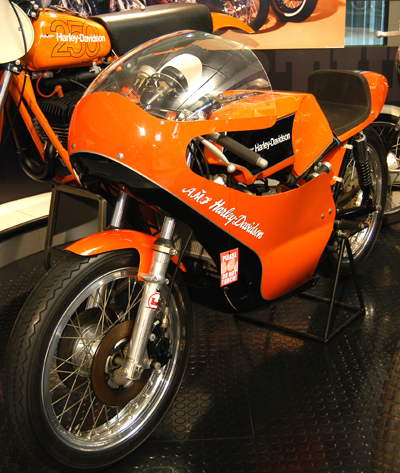 Harley-Davidson has made strategic alliances with a number of companies over the years, none better than with Aermacchi of Italy. This company provided Harley with 125, 165, 175 and 250cc race and street bikes from the late 1950s through the mid-Seventies. This is an Aermacchi-based road racer from 1974. BOARD TRACK RACERS. 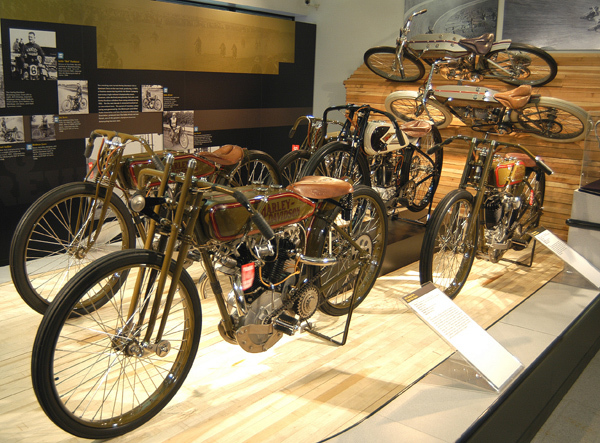 This collection of early board track Harley racing bikes is purported to be the finest ever assembled. 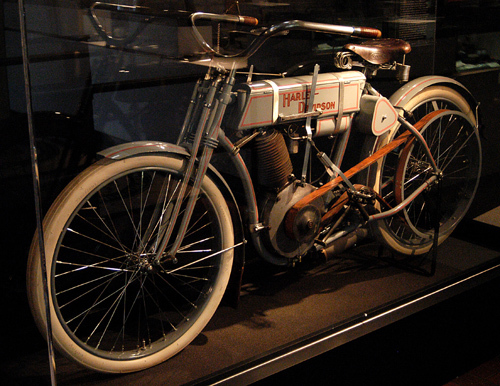 These and the other bikes were secured by the museum's own assets, from Harley-Davidson's own collection and from private collectors and other museums around the country. DOT ROBINSON'S SIDECAR. 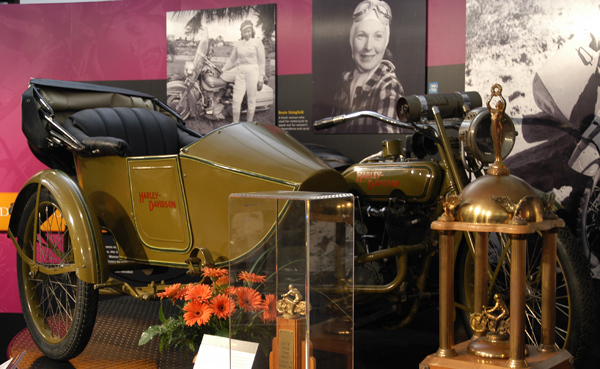 The exhibit recognizes some significant accomplishments by women on Harleys, too. This is Dot Robinson's sidecar rig that Dot and her mother took all the way across the United States. Dot is pictured on the right, and Bessie Stringfield, who rode Harley's for more than 66 years, is pictured on the left. RIKUO. Never heard of Rikuo? 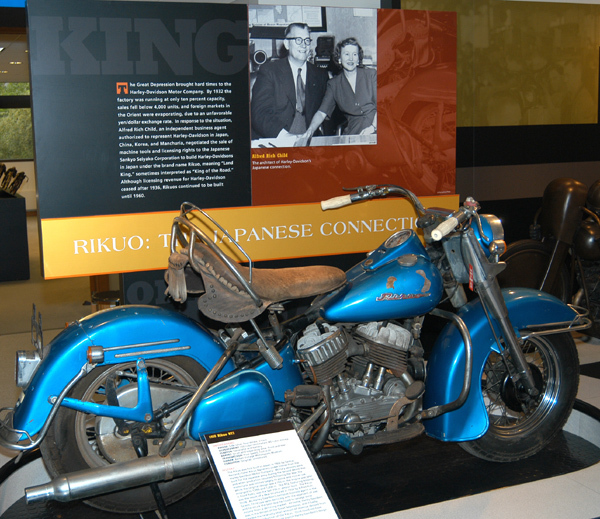 Well, in the mid-1930s, a Japanese company contracted with H-D to build motorcycles in Japan under that name. And although Harley shipped parts to Japan for years and the bikes were sold there until 1962, Harley never got a dime for any of them. Rikuo means land king in Japanese.